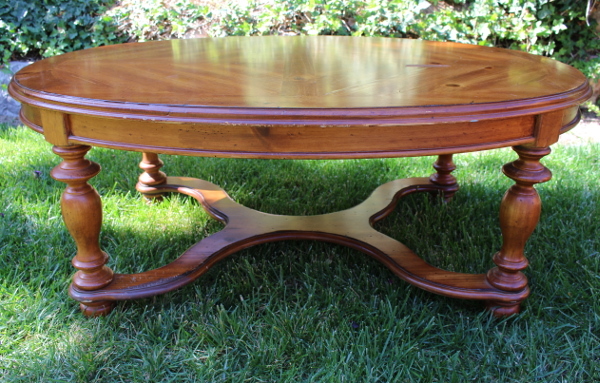 We’ve been in need of a coffee table for awhile and I knew I wanted something kid friendly, soulful and fun. The oval shape seemed like the perfect fit to accommodate our sectional couch and our kids coloring and playing in the living room. The rounded edges are also kid-friendly not sharp and dangerous for little ones who often tumble around the living room. I’ve also been using chalk paint all Summer this year and have fallen in love with its ease of use, ability to cover, versatility and finished look. Love this stuff and have painted a lot of furniture with it. 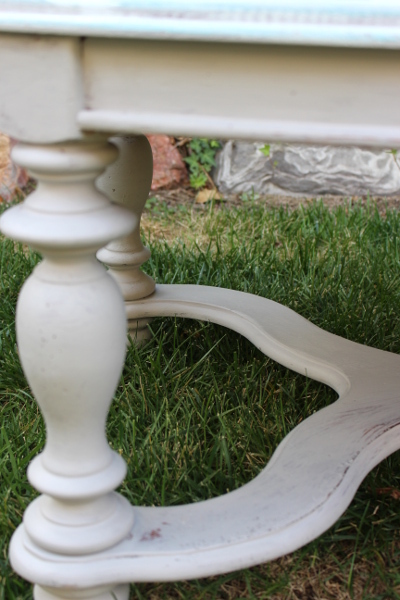 I have been using an inexpensive chalk paint and the matching wax to finish off my projects. This table started out as an old office table at my parents company, it was nothing special but has a nice shelf underneath and was well-made. I was pretty happy when my mom passed it along to me for our living room. To start this project I just wiped the table clean of dust and dirt and started painting it. I didn’t sand or prep the surface any further than that. This is why I absolutely am in love with chalk paint. Its so easy! 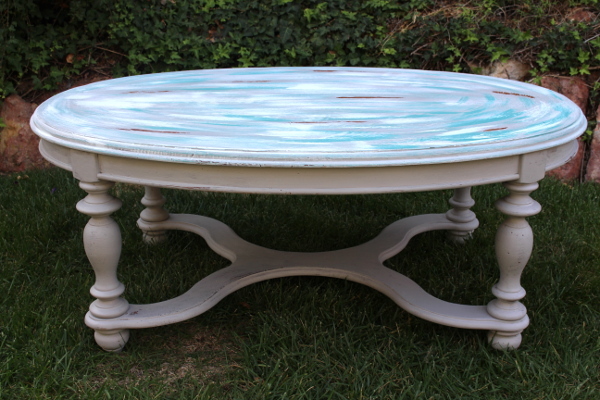 After I painted the entire table Parisian grey I added another light coat. I took my time and watched out for drips because chalk paint dries relatively quick. The goal for me was to keep moving with my painting job. As I began to get the coverage I wanted I backed off and allowed the paint to begin to dry. 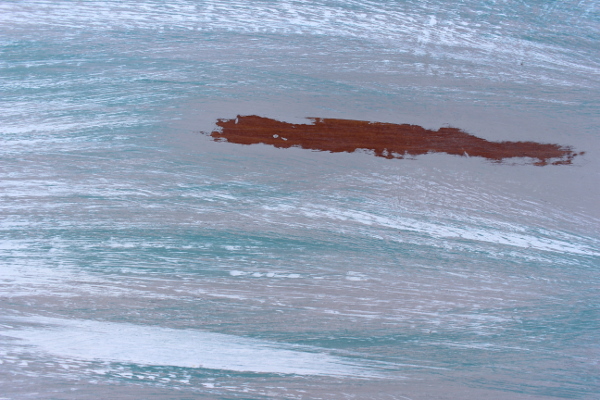 As you can see from the above photos, my intention with this piece was to leave it a bit raw and rough. I wasn’t going for full, perfect, seamless coverage although this is easy to achieve as well with chalk paint which is why I love the stuff. 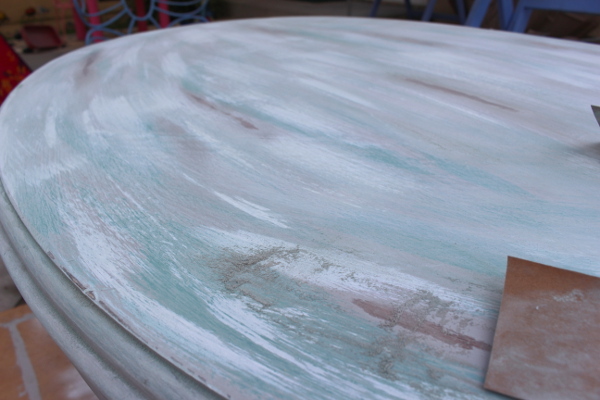 Next, I decided to get really creative and give the table top a soulful and beachy feel to it since we live close to the ocean now and since my style is relaxed. 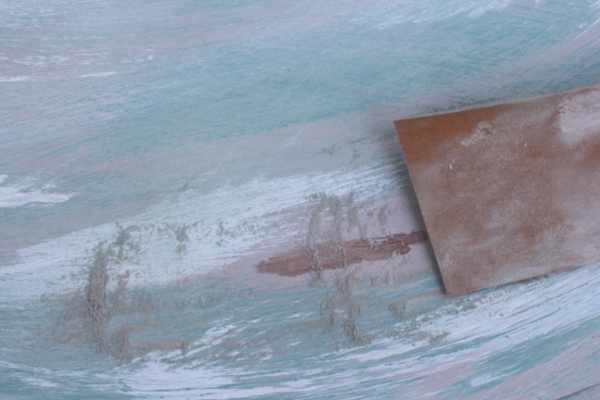 I layered agave colored chalk paint and white with a very coarse-bristled painters brush. 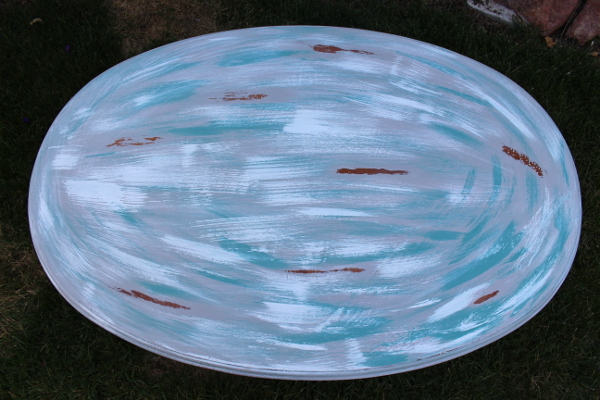 I stood back from the table top and “swept” the two colors in a circular motion similar to the shape of the table. I love how these colors turned out! Next, I started to really sand down the chalk paint. This is not a necessary step but I did it for two reasons. 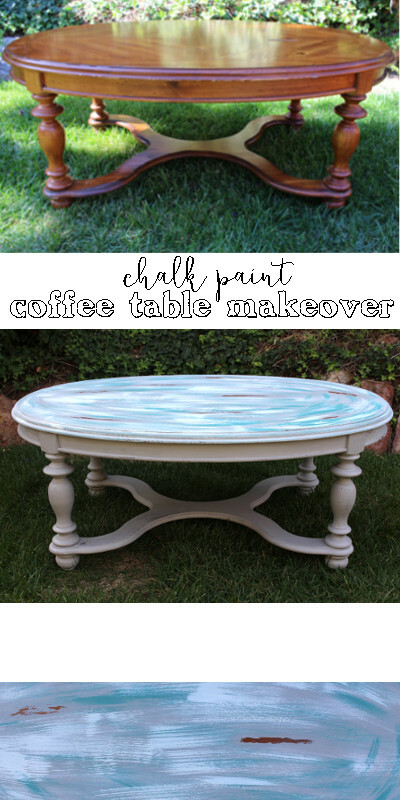 One, because I wanted a roughed up look on this coffee table and chalk paint works great for distressing furniture to give it a rustic look. 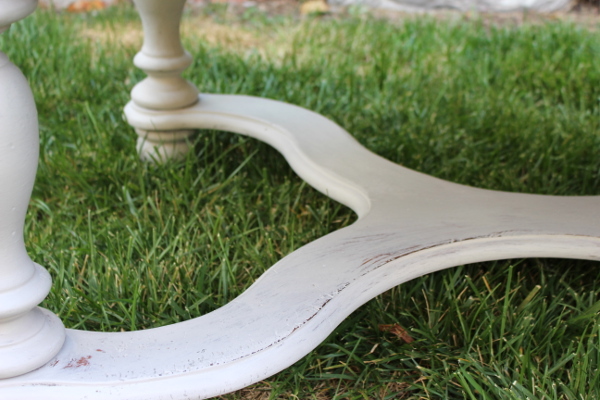 Second, I sanded up the table because I liked the smooth result of the chalk paint sanded. This was the first time I had sanded chalk paint and I was surprised at how smooth it can turn out from just mild sanding with a medium grit sand paper. Amazing! I added a little texture to the legs in some spots as well. 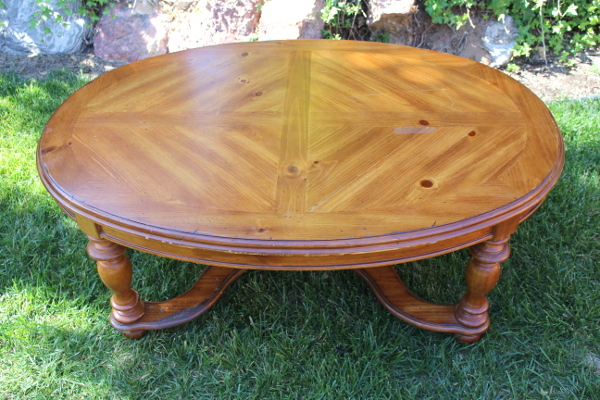 Finally, I waxed the entire table with the wax mentioned above and a dry cloth. I love the wax finish it really gives it a professional shine but that is mild and not glossy. So far, this coffee table has been a great addition to the living room in our house, we appreciate the space and the kids love to play and draw on it. 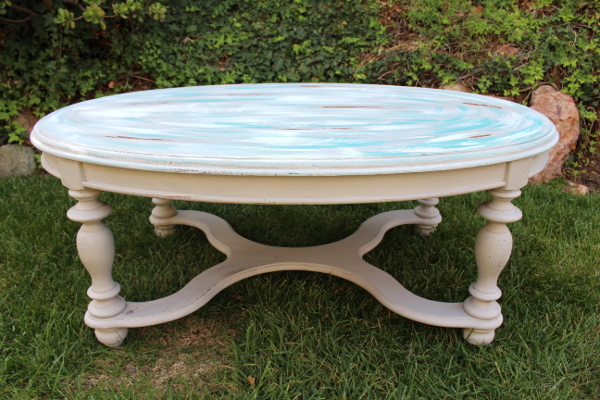 Amy, I love the way you reprised this old table!! !